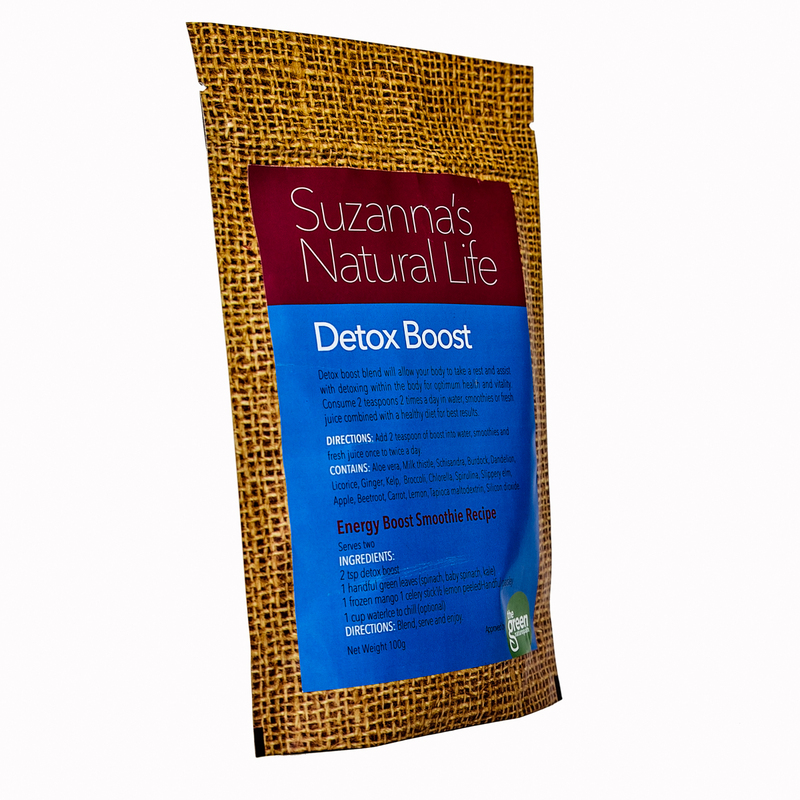 This detox pack will allow your body to rest, heal, restore and nourish while assisting with the elimination processes in the organs for optimum health and vitality. Herbs: Aloe vera, Milk thistle*, Schisandra*, Burdock*, Dandelion*, Licorice*, Ginger*, Slippery elm*, Greens: Kelp*, Broccoli*, Chlorella*, Spirulina* Fruit and Vegetables: Apple, Beetroot*, Carrot, Lemon. Detox and support for all the elimination pathways. High in antioxidants that protects your body from free radical damage. Soothes and heal the digestive system. Supports metabolism, thyroid and healthy blood sugar levels. Helps you gain mental strength. 'Scientifcally created, researched and tested by Naturopath and Herbalist Suzanna Wallace to synergisically work with the whole body for maximum absorption and health benfits'. Naturopath formulated for highly bioactive efficient products. No artificial flavours, colours, fillers or hidden nasties. Milk thistle and Aloe vera in this boost have both been used for their ability to assist the liver in producing more glutathione an important antioxidant that assists in removing toxins from the body. Milk thistle also has regenerative properties assisting with protection and restoration of the liver, while aloe vera helps to strengthen the digestive system and reduces inflammation allowing the body to eliminate toxins more effectively. Schisandra also contains more antioxidants to assist in removing toxins from the body preventing free radical damage. Schisandra also assists the body to adapt with stress and helps protect and nourish the nervous system. Burdock is a blood purifier and assists in removing metabolic wastes from the body. Dandelion helps to improve digestion by stimulating the liver, stomach and pancreas and also acts as a diuretic assisting further into releasing toxins from the body. Licorice and slippery elm helps to soothe inflammation in the digestive system allowing this to heal and restore itself. Ginger assists with digestion, helps promote sweating to release toxins from the skin and assists with blood circulation to further assist with removing toxins away from the body. Kelp improves insulin resistance assisting in balancing blood sugar levels and aids in digesting fat more efficiently. Broccoli contains important phytonutrients that assists in activating detoxification in the body which also promote elimination of detoxification through the different detoxifacation pathways. Chlorella and Spirulina are high in chlorophyll and are important nutrients to assist in alkalising and chelating heavy metals from the body. Apple helps to support digestion and cleanse the blood.